Do you have new preschool students enrolling in a second wave of enrollment this month? For students under the age of five, the first day of dance class can be exciting and full of anxiety for both the parent and the child. 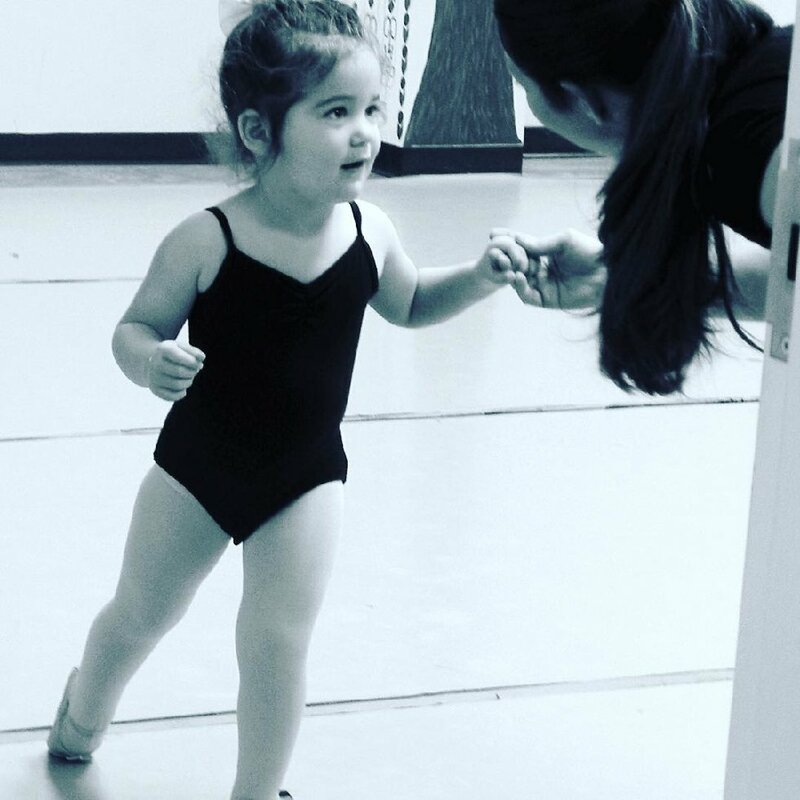 Teachers want to set the stage for an easy, happy, and memorable first day of dance. The following methods may seem simple, but you have to remember that even the smallest details can throw off a three-year-old. I have a strict policy of black leotard, pink tights and pink ballet shoes. If a three- to four-year-old sees another dancer arrive with a bright pink and purple sequined skirt over her leotard, it might set the stage for tears. If everyone is dressed the same it creates an environment of confidence among the young dancers. During the in-person registration process there are always parents who verbalize their expectations out loud: "I just do not think Ella will leave me..." Well, mommy, you just gave her your expectations and now she will more than likely prove you right. I communicate via email the week before, (and then again the day before class), simple instructions of what I want them to do. Walk your child in, do not hold them. Sit in the lobby with them sitting beside you. I will walk into the lobby (this only happens the first week of class) and "gather dance friends." This does several things. It allows the dancer to see Mom sitting, relaxed, like all the other moms which creates easy separation. It offers support seeing little dance friends holding hands. It also gives parents a great photo opportunity of all the little ballerinas holding hands walking into dance class together. Parents also know to have their child "potty" before class and not to open the door during class since this breaks the flow of class. The very first thing I do once we walk into "their room," (I say that immediately to give them ownership and make them feel proud) is give them a rainbow ribbon and play familiar music. We spend just a couple of minutes listening to several different songs that I am sure they will know and their smiles will shine through. I will say "who knows this song" and so on. It creates common ground. Think about when we as adults are meeting someone new. We generally will ask questions and feel a sense of comfort when we have something in common. The same concept applies with three-year-olds. Have your class planned out to the minute. It's important with your youngest dancers to never let a pause happen. To keep their attention, make instructions simple, engaging and exciting. To begin, instead of saying "get in a line," I will say "get on my bus" and collect tickets, drive and make a circle. We then sit down in a circle and take roll. I then do a creative movement activity that they are most likely familiar with like "Wheels on the Bus." Next, they learn to go to their places. I put stickers on the floor of something they will recognize and they quickly run and stand on them. The rest of the class (stretching, simple terminology, across the floor, ending activity) are all done through story telling. They don't even realize they are working hard. They just know they're having fun. I love to end class with a parachute because you can sit on it (or under it) to finish. Give a quick recap of the activities you did (so they might remember one thing to tell their parents) and then line up for stickers. I open the door so parents can get their picture when they curtsy to me for the first time. Parents are not allowed in the dance room and know to stand outside the door when they see me open it. Each dancer gives a curtsy and says "thank you" which shows respect. Parents love this and so do I.